Increasingly many people choose to spend their holidays in Slovenia. The most important reason for this is the beautiful, unspoilt nature which we enjoy every day. But, most souvenir-shops still have their shelves full of the products which show the cities, cultural monuments and the impressive statues of dragons which guard the dragon-bridge in Ljubljana, the capital city. This is why, in 2016, we started to offer our souvenirs with motives from nature. Like with our tours, we aim for quality rather than the lowest prices. And maybe even more than for other products, we think that nature-souvenirs should be produced in an environmentally-responsible way. For this, we cooperate with local producers whenever we can. You can buy our souvenirs at Park Škočjanske jame (Škočjan cave), through our Etsy-shop and directly at us. In 2017 we received the Bear-friendly label for our souvenirs which show pictures of bear, lynx and wolf, in the same way as we received this label for our nature tours! In our vision, when you proudly wear a shirt with a picture of one of these animals, you help to increase the support for their conservation. 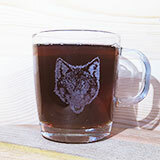 The same happens when you offer your guests coffee or tea in a bear-, lynx- or wolf-mug! With these souvenirs, we give a small booklet with information about these species in Slovenia, their ecology and conservation. 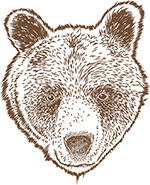 The bear-friendly label is developed in the LIFE DINALP BEAR project, which contributes to brown bear conservation. 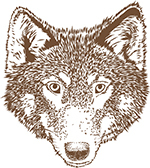 The Bear-friendly label is awarded to practices which contribute to better coexistence between large carnivores (bear, wolf and lynx) and humans. All the drawings on our nature-gifts are made by Paul, who is also one of our tour-organisers and guides. Paul is drawing for as long as he remembers and you see his drawings also elsewhere on the Nature in colour website. He uses his work also for field guides, book-covers and a variety of educational material. For more examples, check out his website called Paul’s animal drawings. Our glass mugs are made in the Slovenian glass-factory Hrastnik. At the factory, they engrave Paul’s drawings in the mugs and in this way, they are an entirely Slovenian product. We are really happy with the high-quality of their mugs, to which they add engrave our animal drawings, especially for us. These mugs are dishwasher- and microwave safe. Because of the technique of engraving, our mugs look especially good when you fill them with strong coffee or tea. We are especially proud of our series of mugs with portraits of the three Slovenian carnivores, which got awarded with the bear-friendly logo. Together, they form a set of three, one with a picture of a bear, one with a lynx and the third one with a wolf. On the back-side, they show the entire animals. Our first glass mug, which also turned out very well, shows the Lipizzaner horse, an autochtonous Slovenian breed from the dry Karst region. It is famous for its good health, intelligence and versatility. Paul went to our friends at the Lipizzaner lodge in order to photograph the horses in action. In this way, he could make the authentic drawings which are on these beautiful mugs! Cotton, from which most t-shirts are made, cannot grow in Slovenia. So we searched for a responsible producer of organic cotton, which ensures that her factory workers have fair working conditions. This is how we decided for the quality shirts from Stanley/Stella. The printing is done in Slovenia, by the specialized firm Rogač (by the way. the name of this firm translates as “Staghorn beetle”). 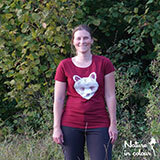 On the picture, you see Jana, one of our guides and tour organisers, who is wearing our shirt. We are really happy with them, they are beautiful, durable and comfortable, just like we intended them to be. We are sure that you will like them too! For now, we have men’s shirts in navy blue and ladies shirts in burgundy red. Both men’s and ladies shirts we have with bear- and with lynx-prints. Once we had our shirts for grown-ups for sale, people started asking us about kids-shirts too. So, we recently added lovely shirts for boys and girls. They have the same colours as the adult-sized shirts: navy blue for boys and burgundy red for girls. These kids’ shirts have all the same print: a drawing of two Slovenian bear-siblings. We chose moderately bright colours for our other shirts, but for one, we wanted a natural Khaki-green which doesn’t stand out at the side of the water. 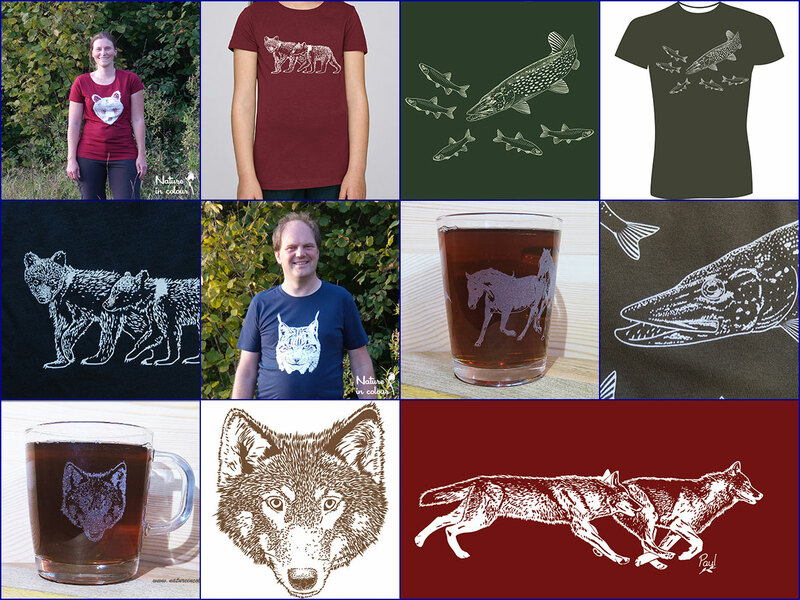 These shirts show a drawing of a large Northern pike, hunting for chub. Will he catch them? These shirts are our latest addition and we have only a few male-sizes as a test for the market.